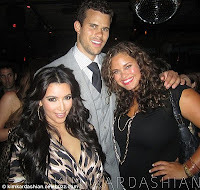 Kaela Humphries, that's right, older sister to basketball player and estranged husband to Kim Kardashian, Kris Humphries, makes her way onto the reality TV scene tonight. As if the Humphries haven't been burned by the reality game enough already. But maybe I'm looking at it wrong; maybe the way they look at it as "strike while it's hot". Anyway, Kaela, a plus size model, who made her debut at New York Fashion Week Spring 2012 last September walking forRichie Rich, will be featured on the debut episode of the CW's new series Remodeled. In the series long time agent Paul Fisher, works to make over modeling agencies around the world; Think Tabitha's Salon Takeover but with models. In the first episode, Fisher will try to recruit Kaela to a talent agency in her native Minneapolis, Minnesota. Not sure if it looks compelling enough to watch but I'll let you know if I do. Anyone who sees it, drop me a line and let me know what you thoughts.